Close all the Programs running in your computer before hand as the installer will forcefully close all the programs running in the background. Make sure that you Blackberry is not connected to your Computer. 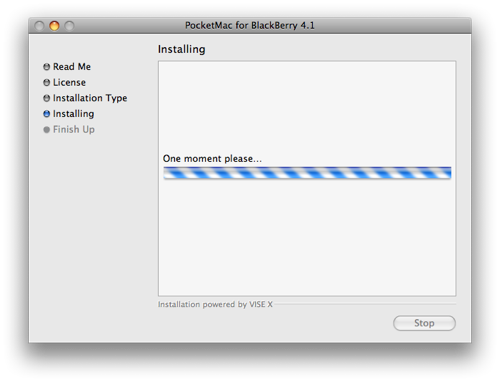 Open the .dmg file and double-click the PocketMac for BlackBerry file installer to begin. In the installation process you will be taken through the following steps: Read me, License, Installation Type, Installing and finish up. In Read Me there will given all the information about the product. Then you have to click on the Continue button some 3 times to get to the License page where you will be asked to enter a Password. When asked if you’d like to create a shortcut on your Desktop for PocketMac for Blackberry, click either OK or Cancel based on your preference. 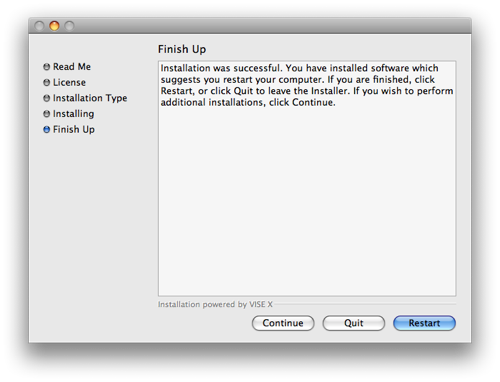 After the installation which will take quite a while you will be asked to Reboot the system or you will be seeing a “Restart” button which will restart your computer and install the Program on your computer. 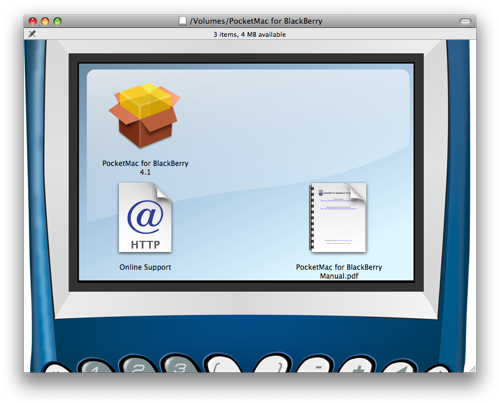 After your Mac Restarts PocketMac for BlackBerry icon appears on your Desktop if you have selected the same earlier, if not you should locate PocketMac for BlackBerry folder in your Applications, and launch it from there. Blackberry option should be selected in the window, which leads to another window having the following options Status, contacts Calender, Tasks, Notes, Bookmarks, Email, Redelivery, iTunes, iPhoto, Connection. 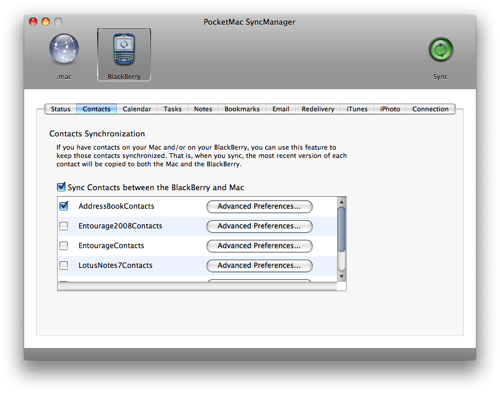 Select the Contacts Tab, here you can see the options out of which you should decide which of your Mac programs you want to sync with your BlackBerry. Now Click on the Advanced Preferences and select what options you want to transfer and click Save. After you are finished with contacts, now go into Calender and select what all Apps you use for your Blackberry for calender notifications. Now Click the Advanced Preferences button. If you have multiple Calendar categories, and don’t want to sync them all, select the Sync only categories selected below and then choose the categories you want to sync. Press Save as you might have done in the earlier step. Now go to the Tasks option and do the same as you have done in the earlier two options and press Save. Then you have to follow the same procedure for Bookmarks and Email. 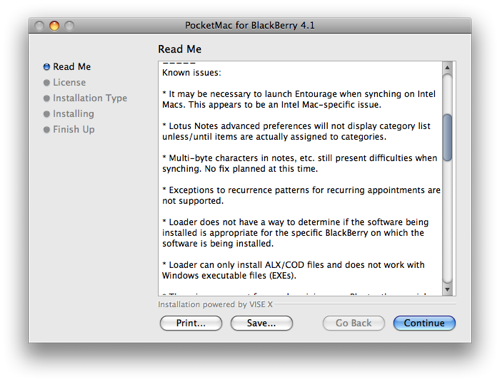 Now after you have selected all the things which you want to be synced with your Mac, now we have to click the Sync button from the main PocketMac for BlackBerry window. This procedure might take sometime depending on the amount of contacts, calender, mails and bookmarks you are transferring.